Nowadays online chatting is very common and enhancing because it is kind of free. So now mostly peoples use online messaging and chatting.some of the laptops especially older models and pics not come with wifi on it.but I'm going to show you an amazing technique through which you will be able to use the webcam on your device. This required just multimedia mobile. Follow these simple steps, which I mentioned below. You have to install smartcam on your Android and smrtcam desktop client on your PC. This software works very well on windows and Linux. Now we will follow the windows route for the work. The first is very simple just download smartcam on your android and for your PC and download it. To connect your android with your PC you can use Bluetooth and wifi signals. Lets connect it with wifi sometimes even Bluetooth is not available or not working, like me my Bluetooth not working right now. Open the smartcam on your phone.>>>> Tap on "menu" button.>>> GOTO settings from the given options. 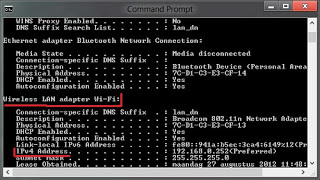 Choose TCP/IP (wifi) for the connection, insert your local IP. How to get computes IP?>>>>>In order to get your computer IP address follow these>>>open start menu>>>write cmd in search bar>>open it>>>enter this ipconfig/all and hit enter. Don't need to worry it will show lots of jargon locate the IP on the wireless LAN adapter. Run on software which is installed on your PC and keep confirming that the preferred connection is TCP/IP (wifi) like you did on android. Now put on your phone wifi and connect it, your PC and phone with the same network. Keep sure that both softwares run simultaneously. On PC and the phone. Now connect wifi from your android phone from the menu. Wait for some seconds and you will see the image will appear on the PC from your phone. NOE ENGOY! This application will work for Skype talk Facebook and others all you need to select them as the camera option through the chat platform. You can use your camera mobile as a webcam. For this purpose You need an Application named Smart cam. This is a free Application connect the PC to your mobile and it will Synchronize your mobile with your personal computer through Bluetooth so you can use your Cell Phone Camera as a Web Camera and have a Video Conferencing.